If I've said it once I've said it a thousand times so far since the Fresh Start relaunch, Venom has become one of my favorite books of the current Marvel lineup. The battle between Venom, now combined with Rex, versus Knull is really 'heating up', and possibly coming to a close. So lets check things out this issue and see what Cates and Stegman have up their sleeves this month that is sure to surprise. Things start out by developing a clear picture of how the new Venom/Rex symbiote combination works and looks, as the two characters prepare for the battle of a lifetime against the incoming Avatar of Knull. 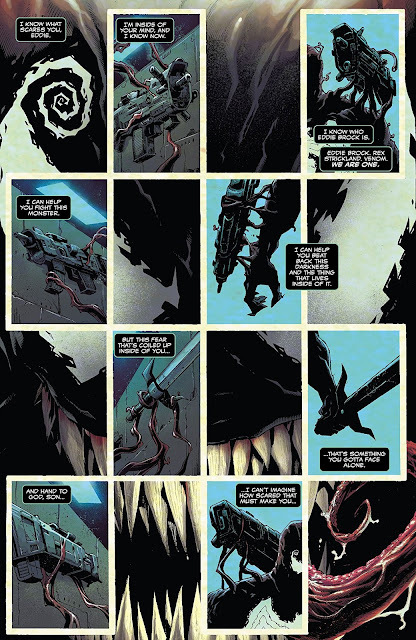 Events escalate quickly when Rex connects Venom to the hive, as the Grendel dragon monster comes crashing down to their location, with a beautiful double page spread. Don't overlook the excellent job that the letterer Clayton Cowles does contributing to such an excellent opening sequence. Between the text-boxes unique to Rex and the giant "KRACKABOOM" on the splash page with Grendel a little love should be sent his way. Back to the story, most of the rest of the issue is spent going through a back and forth exchange, both words and fists, between Knull and Venom/Rex. Each get their fair share of shots in until we reach a point where Knull is able to wrestle away the symbiote in full from Eddie. 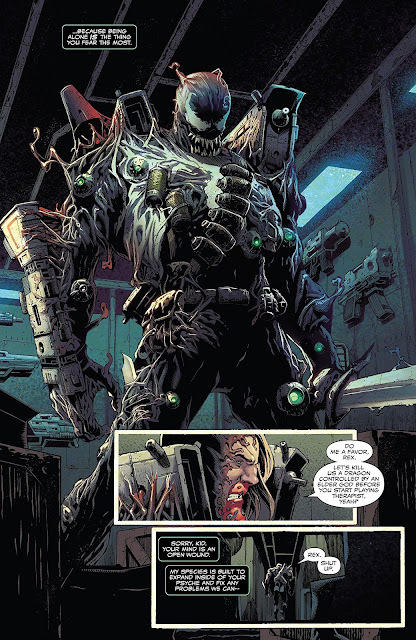 A twist in the story aiding Venom, mainly a ton of grenades that go off inside Knull, temporarily gives Eddie the upper hand. As everyone comes to we find out Rex protected the Venom symbiote from the blast, who goes back to Eddie, but all of this isn't over just yet ... you just cant keep a bad 'god' down. Knull shows he isn't done just yet, but another twists to the events eventually take things INTO the flaming furnace, as Eddie/Venom attempts to hold it shut. The last act is pretty intense, ending on a huge cliffhanger where you're not sure who exactly is left standing, but what I do know is I cant wait for next issue where things will sort themselves out. 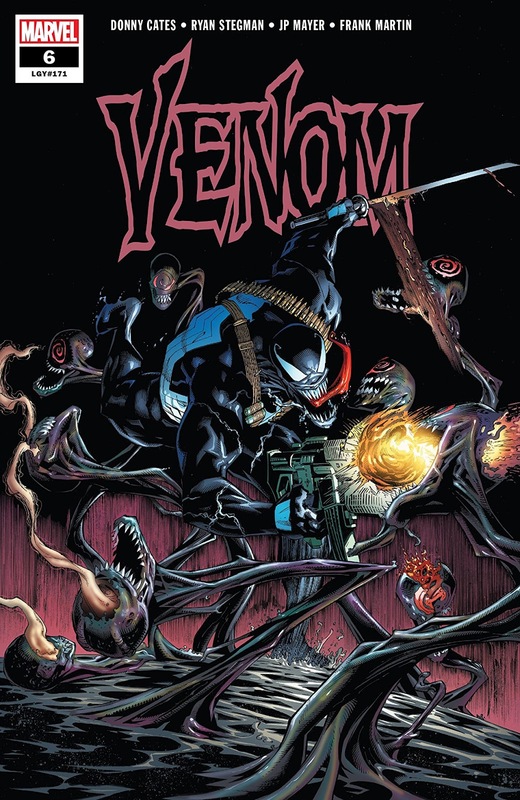 Overall, Venom continues it's hot streak, and where lots of modern comics can falter with full fighting/filler issues where it feels like a story gets stuck in place, this series is able to do the opposite keeping a reader engaged and interested throughout its run. Cates, Stegman, and the rest of the team involved in this title, really truly feel like they care about the events unfolding on the page, almost like you can sense their excitiment while reading, making the book a joy to read and look at. Again really the downside to this issue is that it's mostly just a huge fight issue between parties that ends on a nice cliffhanger, but throw in a few nice twists for good measure, and even if things don't move forward a ton I had a great time with it. 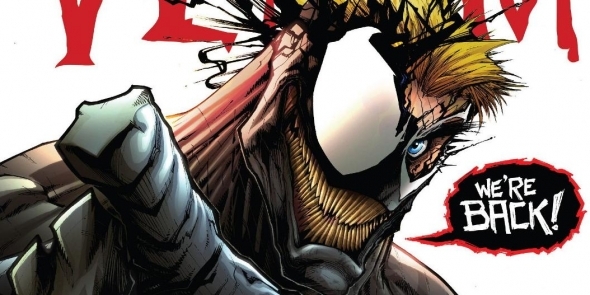 Venom fans should enjoy what they're getting new and old alike. Venom continues it's hot streak possibly bringing some sort of conclusion to the battle between Venom and Knull but who's to say for sure. Stegman's pencils continue to push this series into must buy territory, combined with the storytelling of Cates, this is almost unquestionably Marvel's consistently best book.